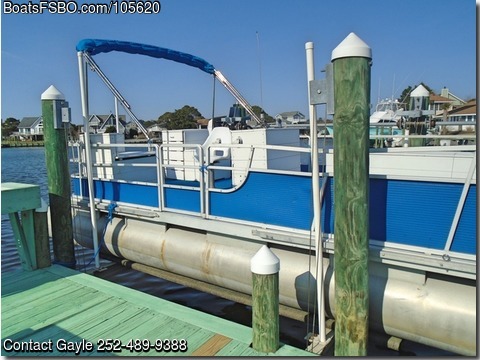 Contact the owner at 252-489 nine three eight eight...Decription: Are you ready to spend your summer enjoying the water, this great maintenance free party boat is waiting for you. 24-foot Harris Kay aluminum hull pontoon boat. Although this boat was manufactured in 1977, the only thing remaining from the original boat are the pontoon hulls and sides. The boat has been repainted, redecked with marine grade plywood and recarpeted. Polywood console and benches with cushions, provides easy cleaning, durability and loads of storage. The 90 HP Evinrude E-tech 2 stroke motor was newly purchased in 2011 and low hours of usage. New in 2018 stainless steel Bimini top with cover. Boat trailer was sand-blasted and painted in 2017 and includes custom-made trailer cover for storage. No work to begin your summer fun and polywood benches make it carefree for years to come.